KRIPTOVOR ransomware uses sophisticated techniques to infiltrate computers and hide from its victims. Use Reimage to determine whether your system is infected and prevent the loss of your files. 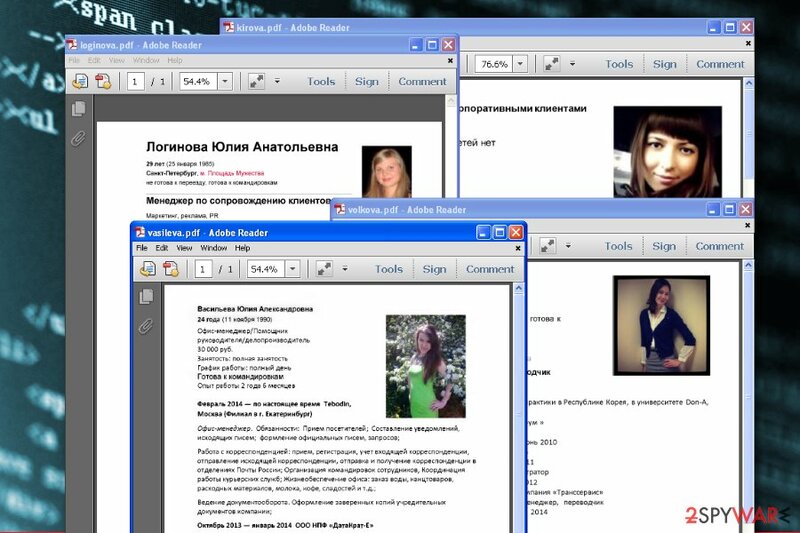 KRIPTOVOR is a ransomware virus that mostly targets Russian companies. KRIPTOVOR is a file-encrypting virus that uses AES cryptography to make files unusable on the affected machine. Originally, it adds .Just file extension to the data, but other versions of the virus append .neitrino and .excuses suffixes. 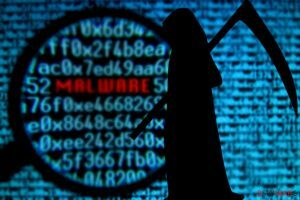 The malware was first detected in 2014, though it is still active in 2018. KRIPTOVOR spreads via malicious spam emails that include fake resume. However, the attachment is a corrupted file that includes malicious content instead of person's resume. Once opened, malware downloads password-protected RAR file which includes AdobeSystems.exe. This file is the executable of the KRIPTOVOR. KRIPTOVOR ransomawre virus is executed when a victim opens obfuscated resume in the PDF file. On the affected machine, KRIPTOVOR ransomware does not act like typical ransomware. It encrypts files using LockBox 3 which uses AES cryptography. Additionally, it scans for login and password information that might be saved on the targeted data. Thus, the virus also aims to extract potentially useful information too. After [Date] requests will be ignored. Authors of KRIPTOVOR provides a contact email address for victims who are interested in data recovery. Criminals ask to contact them the same day as the infection occurred. However, security specialists do not recommend doing that because it may lead to money loss. Authors of ransomware usually demand to pay the ransom in cryptocurrency, but they may never give working decryption key. For this reason, we recommend proceeding with KRIPTOVOR removal. As you already know, the virus might try to extract personal data, so it’s better to terminate it as soon as possible. In order to remove KRIPTOVOR correctly and avoid possible damage to the system, you need to employ Reimage or another anti-malware tools. If you have difficulties with elimination, follow the guide below. KRIPTOVOR is a malicious program that is designed to encrypt files and demand to pay the ransom in order to for the decryption tool. Neitrino ransomware virus. 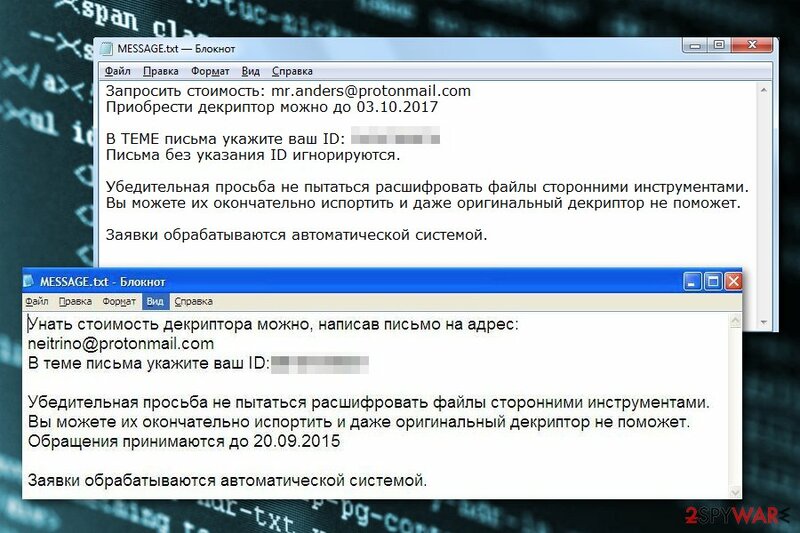 The virus was first detected in autumn 2015 spreading in Russia via malicious spam emails that include obfuscated PDF file. It uses AES cryptography appends either .neitrino or .NEITRINO file extension. Then it downloads a ransom note in MESSAGE.txt in each folder that contains locked files. On the affected machine, malware is executed from AdobeUpdate.exe and svchost.bat files which are dropped on a system when a user opens a malicious email attachment. The purpose of the virus is to make people pay 5,000 rubles or more for file recovery. Neitrino virus is a version of KRIPTOVOR ransomware that acts very similar to the original version. According to the ransom note, victims have to send an email to neitrino@protonmail.com or mr.anders@protonmail.com address in order to get further recovery instructions. Though, it is not recommended process. It’s better to remove KRIPTOVOR Neitrino virus and try recovering files from backups or using third-party tools. Excuses ransomware virus. In 2018, a new variant of KRIPTOVOR has been spotted spreading and targeting Russian users again. This version uses filemarker 0x20000000 and appends .excuses file extension to the targeted files. KRIPTOVOR started adding .excuses file extension in June 2018. We want to remind that it’s not a good idea to trust cyber criminals. They will demand to pay the ransom and might disappear as soon as you send a couple of hundred of dollars. Hence, focus on KRIPTOVOR removal and try alternative ways to recover your files. If the letter does not seem to be sent for you or you did not expect to receive it, stay away from the attachment. Also, you can check it with online file scanners before opening it. The only correct way to remove KRIPTOVOR from Windows PC is to employ professional software. Tools like Reimage or Plumbytes Anti-MalwareMalwarebytes Malwarebytes can quickly detect malicious components and eliminate them from the device. However, if you have some difficulties, you should reboot the device to Safe Mode with Networking as explained below. After KRIPTOVOR removal, you can plug in the external hard drive with backups or try our suggested third-party tools. You can find them listed below. However, we want to stress out that the official decryptor is not released yet. So, chances to full recovery are low if you do not have backups. Log in to your infected account and start the browser. Download Reimage or other legitimate anti-spyware program. Update it before a full system scan and remove malicious files that belong to your ransomware and complete KRIPTOVOR removal. When a new window shows up, click Next and select your restore point that is prior the infiltration of KRIPTOVOR. After doing that, click Next. Once you restore your system to a previous date, download and scan your computer with Reimage and make sure that KRIPTOVOR removal is performed successfully. Guide which is presented above is supposed to help you remove KRIPTOVOR from your computer. To recover your encrypted files, we recommend using a detailed guide prepared by 2-spyware.com security experts. Data Recovery Pro is not an official decryptor for KRIPTOVOR ransomware. However, it might be helpful. The program is designed to restore accidentally deleted or corrupted files. ^ Maria Korolov. 93% of phishing emails are now ransomware. CSO. Security news, features and analysis. ^ Ryan Whitwam. Hospital pays ransomware, but doesn’t get files decrypted. ExtremeTech. News and analysis of emerging science and technology trends. 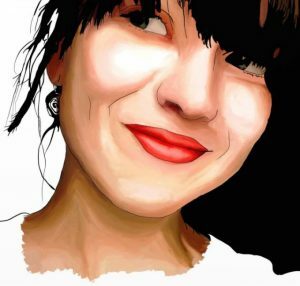 ^ Emma Bordessa. Phishing emails and malicious attachments responsible for 34% of cyber attacks. IT Governance. IT governance, risk management and compliance solutions. This entry was posted on 2018-06-12 at 03:29 and is filed under Ransomware, Viruses. You can quickly scan the QR code with your mobile device and have KRIPTOVOR virus manual removal instructions right in your pocket. How did you remove KRIPTOVOR virus?